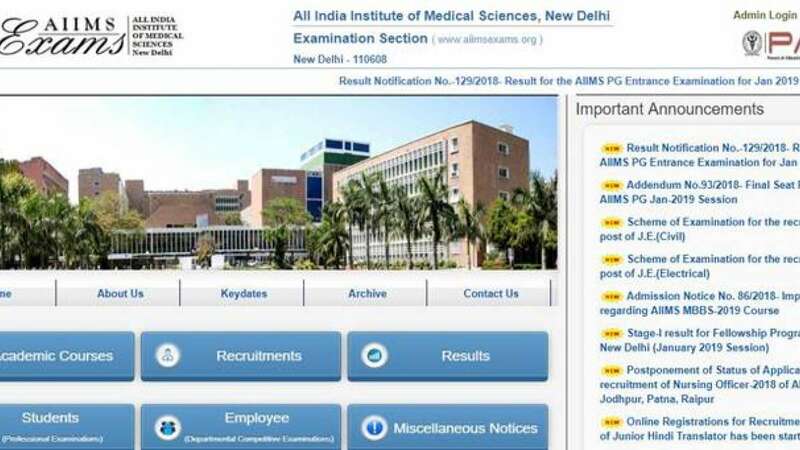 New Delhi : The All India Institute of Medical Science has announced the results of entrance examination for PG January 2019 session. Candidates who had given the examination that was held on November 18 can check the results through the official website, aiimsexams.org. AIIMS PG 2019 entrance exam was held for admission to various MD courses at AIIMS New Delhi, Bhubaneswar, Bhopal, Patna, Jodhpur, Raipur and Rishikesh. All India Institute of Medical Science conduct PG entrance exam to evaluate eligible candidates for admission to five MDS programmes and a total of approximately 499 MD/MS seats in Basic Clinical and Clinical Sciences. Apart from the main centre in New Delhi which was established in 1956, there are six other colleges at various cities across India.